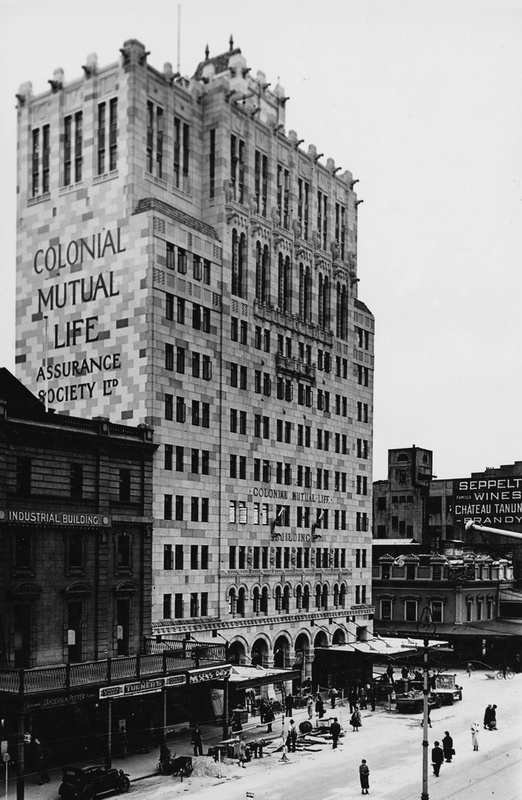 The Colonial Mutual Life Assurance Co. (CML) building is one of the most iconic built landmarks of King William Street. 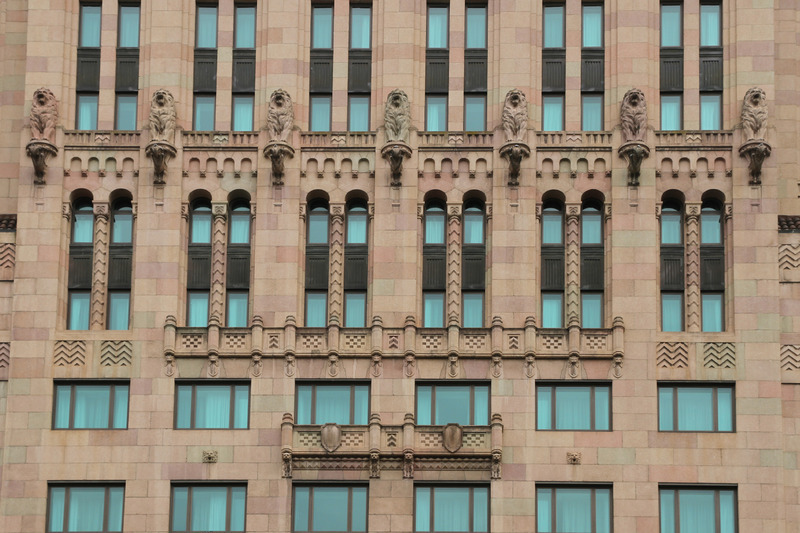 The building’s grandeur and high quality neo-Romanesque detailings are perhaps more notable when it is revealed that it was constructed in the mid-1930s at the height of the Great Depression. Construction of the new office building at the time gave hundreds of men in the city much needed work. The CML building was designed by father and son architecture firm Hennessy, Hennessy and Co., who were also responsible for the company’s office buildings in Brisbane, Durbane (South Africa) and Wellington (New Zealand). Benedict stone from Queensland was brought over for the King William Street and Hindley Street facades. The lions, gargoyles and vultures that adorn the facade were also cast in Benedict stone. After only nine months of construction, the fourteen-storey building was officially opened on 17 December 1934. The Governor of South Australia, Sir Winston Dugan, officially opened the CML building with a golden key. Guests, including Premier Sir Richard Layton Butler, attended the ceremony and were treated to refreshments in the office’s basement. In the 1980s, the building underwent renovations including the addition of light wells for the southern façade. The interior of the CML building was also significantly altered at that time. In recent years, however, the heritage-listed building has stood largely empty, and become the victim of vandalism and graffiti. In 2012, the Adelaide-based company Adabco Properties purchased the CML building and undertook $55 million renovations to transfer the former office block into a boutique hotel. In 2015, the Mayfair Hotel opened to the public. The new hotel includes 170 suites, a bar and restaurant and other retail. A new glass extension known as the ‘jewel box’ was also added to the southern end of the building. The interior’s renovations were designed in keeping with many of the original 1930s features of the buildings. 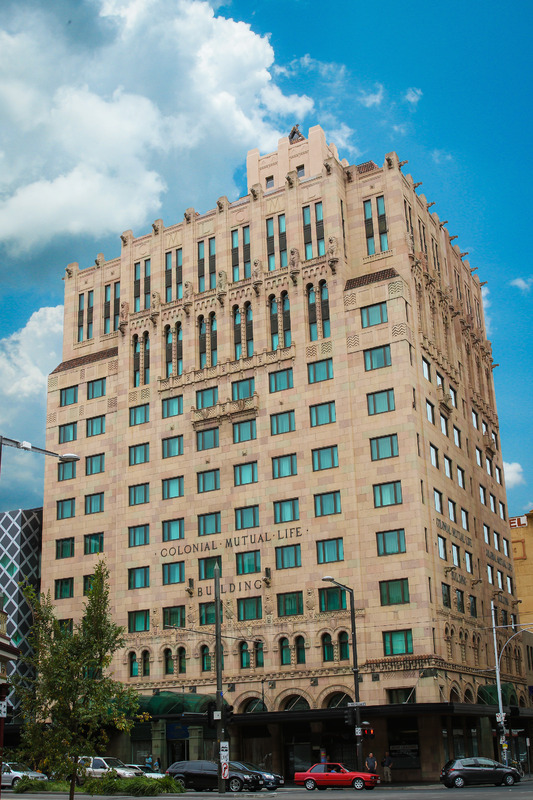 Adelaide City Explorer Team, “Colonial Mutual Life Building/Mayfair Hotel,” Adelaide City Explorer, accessed April 26, 2019, https://adelaidecityexplorer.com.au/items/show/173.